Murchison falls national park is the number one protected area in Uganda gifted with all the well-known big five wild life species .Within the park’s 3,840 square kilometres, visitors on their wildlife safaris in Uganda can watch only the big four wild life such as the African Big Elephants, Cape buffalo, Leopard and the Lion. 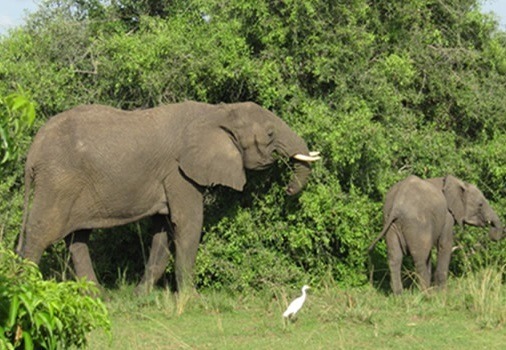 These prominent wild life species are easily seen and watched in the northern part of Murchison falls national park which is situated above the river. The prominent Nile River which divides the park into two parts,offers the travellers chance to enjoy ferry crossing from the southern part of the park to the Northern part were most of the wild life in the park is found. The white Rhinos which were extinct in the year 1983 can now be watched by tourists on their Uganda safaris on the 7000 hectare of land covered by Ziwa Rhino Sanctuary. The sanctuary is located in the southern direction from Murchison Falls Park and can be easily visited by tourists along the way in Nakitoma when they are travelling from Kampala to Murchison falls national park through the Nakasongora route. Murchison Falls Conservation Area and adjacent famous Budongo Forest reserve contain 76 Species of mammals and these can be watched and viewed by the travellers on their safaris to Uganda. The impressing mammal species include the giraffes, Nile Crocodiles and bushbucks among other species. The crocodiles, hippos, and large herds of Buffalos can be viewed by tourists participating in the launch cruise trip in the wonderful waters of the Murchison falls. The most adventurous activity starts from paraa at 9:00am in the morning and 2:00pm in the afternoon and the cruise takes 3-4 hours. In the Budongo forest Reserve travellers can enjoy the sights and views of various Primate Species and some of these include the endangered species of the Chimpanzees, the mainly watched along the route include the olive baboons, Blue and Red tailed monkeys, the forest inhabitants like the white monkeys can be easily watched by tourists in the middle of Kaniyo Pabidi forest Reserve, Budongo Forest Reserve which also constitute part of the Murchison falls national park.